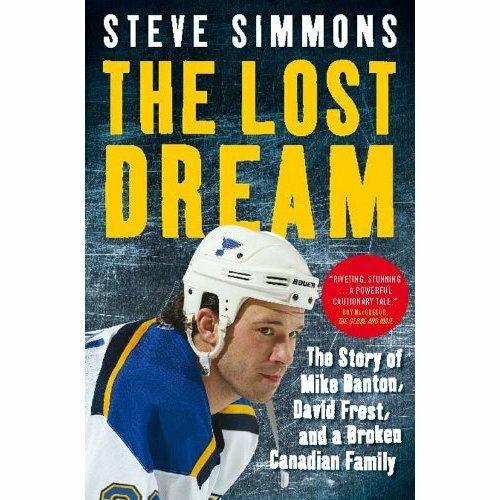 One of the most promising titles of the 2011 hockey book season promises to be Lost Dream, The: The Story of Mike Danton, David Frost and a Broken Canadian Family . Like the stories released of Theo Fleury or Bob Probert in years past, this book is not a squeaky clean fun book to read. It is an understatement to say that the Danton/Frost story is sad or even down right disgusting. Perhaps it is because it is so incomprehensibly bizarre, but it is a story that some how captivates us for reasons we might not fully understand ourselves. Maybe it's because it could have happened to any of us or to any of our children. The inconceivable story is of course that of Mike Danton, the NHL player who ended up in jail in a failed murder for hire plot. He wanted his agent, David Frost, dead, or at least that was what the authorities said. Danton later said he wanted his father, Steve Jefferson, gone. Guilty in the court of public opinion if not the courts of law, David Frost is essentially a predatory creep who preys upon young boys and girls including Danton. In the process the Jefferson family (Mike changed his name to Danton and has nothing to do with his birth family) is torn apart. Danton blames his family, while the family lames David Frost. Watch: George Stromboulopoulos Interviews Steve Simmons. Mike's brother Tom Jefferson also talks with Strombo about his first hand experience with David Frost. 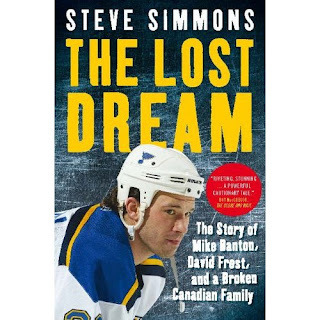 At first I was a little guarded in my expectations of this book since Steve Simmons was writing it. Scratch that thought from your head immediately. Yes Simmons is known for being provocative and controversial but I was thoroughly impressed with the level of writing in this book. Simmons, who has been following this sordid story since 1999, kept it highly professional and makes no judgements or stands. He presents the facts and leaves it at that. Fairly recently, a book about my life has been published and is now in bookstores available for sale. Even though this book has my picture on the cover with my name in bold lettering, I had nothing to do with the book. This book was authored by someone that I have never spoken one word with in my entire life. I was totally taken back when I had heard that a finished copy of a book, regarding my life, was now selling in stores. I was neither interviewed nor was I asked to comment regarding the contents of the book. The author took it upon himself to interview my biological family – a family that I have not spoken to in over 12 years – regarding my life. This is a family that I left home at when I was 11 years old. How the hell can they know anything about my life? Yet, they are profiting off of a book that has been built on lies and fabrications. I have read only two chapters of this book. In these two chapters, I have discovered so many lies that it sickens me. Lies that can, and will be, easily proven to be false. The author did a poor job at fact-finding as he allowed my biological family to spew all of their hate for the last 20 years into a book that could, hopefully, bring them some financial assistance that they so desperately need. But the author, his editors, and his publisher never asked me a single question. It was not as if I was asked and offered “no comment.” I just was not asked at all. How is that for journalistic integrity? He goes on at length talking about how life as a pro hockey player is not nearly as glamorous as we all think, and takes great offense to one Simmons allegation in particular - that one of Frost's children is actually his. He also says he is considering legal action against the author and/or the publisher for this falsehood. Two things I know for sure: 1) that the story of Mike Danton and David Frost is as sick and as twisted far more than we will ever know, and 2) while Simmons and Danton both will stand behind their respective sides of the story, only one man knows the complete truth - David Frost. This book is a necessary and significant piece of work, but not easy to read. You may want to skip over chapter four completely, as it a full description of a horrifying horrific sexual, physical, mental and assault on a 13-year-old Tom Jefferson with Frost in supervision. Granted it is only one side of the story, but it leaves you angry and wondering how in the hell the police could not make now-dismissed charges against Frost stick.